Saturday was the annual Help Portrait day. The team in Columbus, Ohio had a pretty amazing day. At one of our sites, we had about 60 families come through in a 2 hour period. We did about 40 families at the last site of the day. I haven’t seen the grand total, but if it’s anything like previous years, we normally have about 300 families come through on that day. I took the image above at our my team’s second site. It was the YMCA in Grove City and the room we were shooting in was near the pool. Someone left the door open to the pool and the humidity in our room shot up about 300%. Talk about steamy. One person decided to add a little finger “painting” art to the condensation on the glass and I felt the need to capture it. The fact that it was a heart felt like the right image to capture. There were about 30 people on the Help Portrait team between photographers, editors, and people just helping to get the clients through the process. As I said in my previous posting, this is a truly amazing event. Not only do we get to pay forward to people in need, but we also share a lot of camaraderie and knowledge as well. I learn so much from my fellow photographers. One of the happy stories of the day was from an 8 year old that Gabe and I were talking to. Gabe asked him what he wanted to be when he grew up and he said he wanted to be a photographer. We were impressed and asked him why he wanted to be that. He said that he took a photography class at summer camp and enjoyed it. He went on to explain to us the rule of thirds (where you divide your image into thirds and center the subject in one of the outside thirds, not in the middle) and he explained why you did that. OK, so for an 8 year old to get that and remember it, we were very impressed. He was looking forward to going back to summer camp this year to attend another class “cause he would be a year older now and be interested in the advanced class.” I think Gabe and I are going to sign him up for next year! His little brother is about 1 and a real cutie. His dad was holding him while they were waiting to view their pictures and I was talking to the little boy. He stretched out his arms for me to take him, so I did and he promptly laid his head on my shoulder. Most kids that age are scared of strangers and this little guy practically jumped into my arms. Later in the day, I had a mom and her two young sons come to my station. The boys were dressed in Ohio State Buckeye gear and they loved the Buckeyes. I had their mom sit on our posing bench and positioned them behind her. I told them that when I counted to three, I wanted them to pop out from behind mom and shout “Buckeyes!” They loved it. They were giggling and having a great time. My saddest moment of the day was with a mother and her two children, a boy and girl. The mother seemed to be very angry and unhappy while she was there. She was snapping at the children while I was getting them posed, though I didn’t see or hear the children say or do anything unpleasant or disrespectful. In fact, the two kids seemed very happy and easy going. I don’t know the whole story, but I was a little concerned about her and them. To exhibit that behavior in front of a perfect stranger was, to me, odd, and I had to wonder what it was like when they were alone. It’s not that I feared for their safety, but to be that unhappy in front of a stranger, how must she be when alone? I guess that I see the young children as full of hope and life. Children don’t come into this world with the preconceived notions and biases of their parents. In a way, they are a blank book waiting to be filled with memories, hopes, and dreams. No matter what their situation, they can be filled with joy and a desire to make their way through the world, like the young photographer, or they can be filled with anger and resentment and see only the dark and unhappiness that is in the world. I wish the young photographer success as me moves through life and the two children a way to avoid gathering in the unhappiness and anger they see coming from their mother. Help Portrait 2012 is done and I’m looking forward to next year. Sorry that I’ve been gone for so long. I’ve been traveling on business and in meetings all day, and had to do some homework during the evening, and just didn’t get a chance to get near the camera, let alone near the wordpress.com site to post anything. I’m back and here’s today’s posting. This is a portrait I took of my friend Carrie. She’s expecting her first child and, as with all women who are nearing full term, are just plain beautiful. 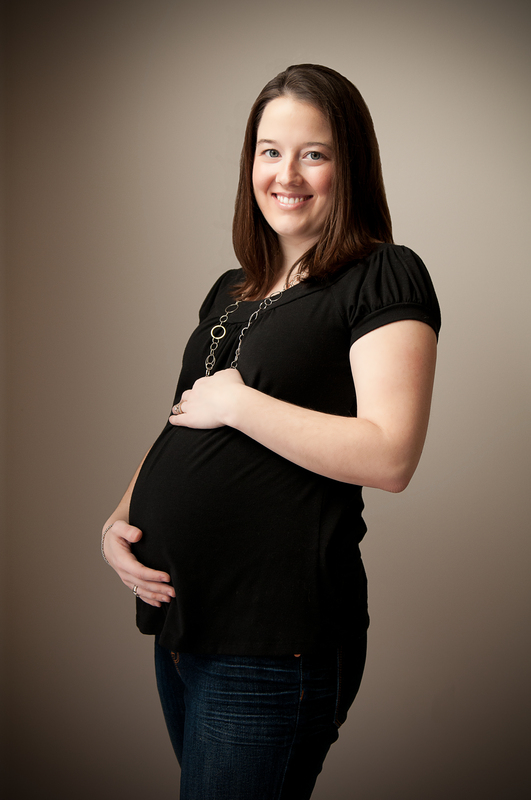 I spent a few hours at Carrie’s taking some maternity images for her and her husband. It’s really kind of strange to me. When Carrie and her family moved in next door, she was just a young woman in Middle School. It just seems like time has gone so quickly for her to be grown up, married and now expecting her first child. From what I was on Saturday, she and her husband are ready. I look forward to watching them bring a new life into the world and raising their child. And for you photographers in the crowd, this was natural lighting coming in through their dining room window. I couldn’t have asked for better lighting.